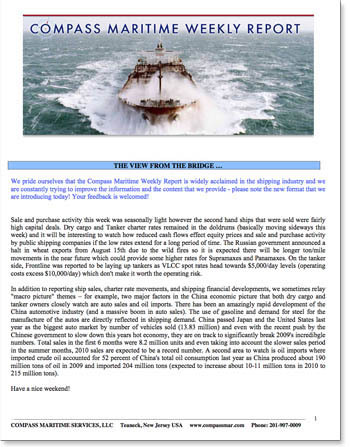 Compass Maritime produces a highly acclaimed weekly report that focuses on the ship Sale & Purchase markets as well as the financial markets in the maritime sector. If you are not currently a subscriber and would like to receive our Weekly Market Report by email each Friday, kindly send your request to us at Reports@CompassMar.com. Please provide your contact information and background or your company. Inquiries for previous reports, or parts thereof, including asset prices and market data, should be sent to Reports@CompassMar.com.